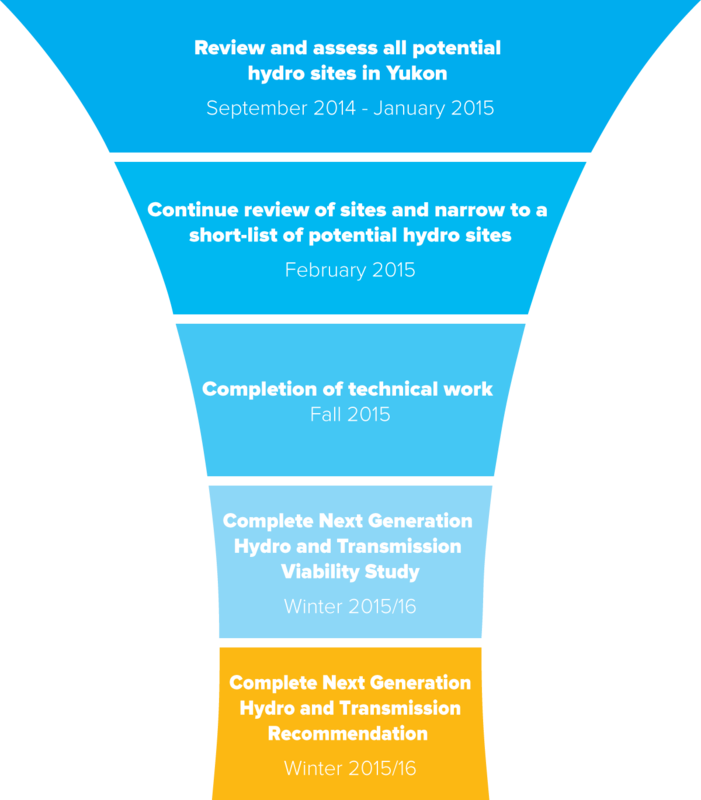 Next Generation Hydro is a multi-phase project. Over the next 18 months, Phase 1: Project Identification will unfold with twin technical and engagement processes. Based on the documentation from these two processes, the YDC board will make a recommendation as to which projects might be best advanced to Business Case development for Yukon government. Once the technical team develops a short list of projects they will explore the need, financial risks, socio-economic effects, environmental effects, and impacts and opportunities for First Nations through a set of technical papers. A matrix of trade offs will result per project and be presented in the summer 2015 as the draft Next Generation Hydro and Transmission Viability Study. In parallel feedback will be gathered through the engagement process and will be compiled into a Discussion Paper. Both of these documents will be presented to the YDC board. The technical team is reviewing over 200 potential sites in the Yukon against the criteria outlined in the Yukon Hydroelectrical Power Planning Directive issued by Yukon government. In addition a number of technical criteria are being used to determine the sites with the most/best potential to meet future needs. Some additional screening criteria include: eliminating hydro sites that exist in National Parks, eliminating sites that are too far from the grid to be feasible or that are on any main stems of the Yukon river. Once the technical team has narrowed the list of sites they will compare the viability of short listed sites and ultimately develop a recommendation for one or more of these sites and further research and assessment to be considered. A parallel engagement process will unfold where First Nations, as well as stakeholders, will be invited to participate in a series of technical workshops where the results from the technical work will be shared, discussed and feedback solicited. A series of public speaking events, newspaper articles, and household flyers will be used to keep the public informed and provide opportunities for input. Download the project process chart to see how the work will proceed over the next year. Check the Get Involved page to learn about upcoming opportunities.